My last two posts on iPads and good teaching have focused on teaching and learning writing. Now I’m moving on to my favorite subject as a teacher – Mathematics. I love Maths – both learning and teaching it. For those who don’t know me ( which is obviously most of you reading ), I am a Primary ( Elementary ) School teacher but I have spent most of my 25 year teaching career also tutoring High School Maths on the side, supporting many children who have missed out on understanding important Mathematics concepts. Maths involves an incredibly diverse range of processes, ideas, skills and concepts. Both children and teachers alike enter into Maths teaching and learning at different levels, depending on their personal experiences, successes and challenges with the subject. Over the years I’ve been involved in the conversation about teacher-led process/algorithm based teaching which I ( along with the parents of our children we teach) experienced as a child vs a more student centred, understanding and multiple strategy based learning approach more prevalent today. The challenge facing us is that, while education training is rightly focused on the latter approach, the traditional process system still holds sway in many homes and can sometimes be a fallback for teachers who are unsure in Maths. It is also, in my experience, very much the default teaching method in many secondary/high schools in my part of the world. I won’t get into the pros and cons of the two models – that’s for a later post. 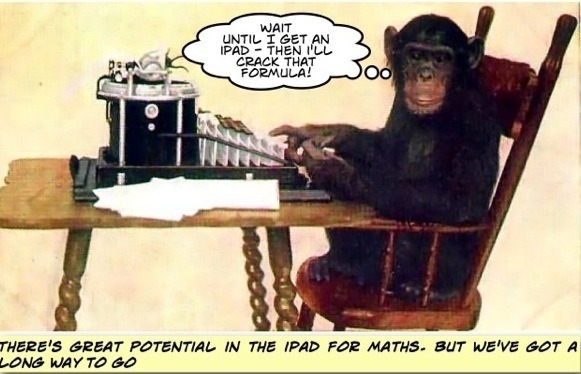 This post I again focus on where the iPad (and other iOS products) sits in the world of Maths Education and whether, along with good teaching practice, it can have an impact in developing skilled mathematicians of the future. There’s a lot of potential in the apps available on iOS devices for Mathematics but overall I think they fall a little short of what I would like. Many of the apps are more directed towards the traditional memory/algorithm/procedural methods of teaching or drill practising of number facts and operations. I think where they may fall down is in the fact that the app developers are not necessarily involved in education and are basing their app concepts around traditional Maths they were exposed to. The number fact/ 4 operations apps serve their purpose of consolidating learning and improving automatic recall but they don’t necessarily support the initial teaching and learning required to develop understanding of concepts. Here are some examples of apps in this category. 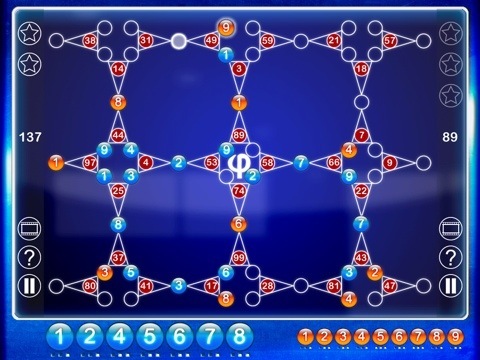 Math Mago – a large grid of numbers 1-9 to eliminate by solving 2 number equations. At least there is more than one answer and it makes you think about which numbers to choose so you have options left. Sort of open ended but still just basic equations. Math Kid – more number facts to solve but at least you get a visual aid to support your thinking after a few seconds instead of just timing you out. An improvement on others above in terms of mathematics teaching an learning. 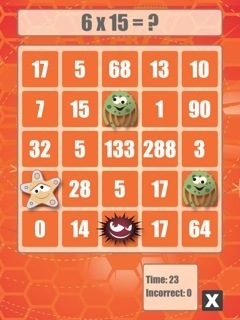 Operation Math – lots of engaging bells and whistles based around secret agent missions but behind it all jut another number fact time limited practice app. 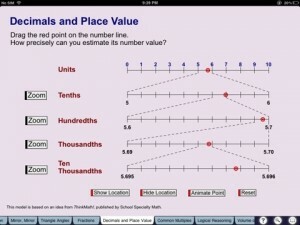 Mathboard – a very popular app that has strengths. It generates equations involving all operations for solving at different levels and provides support in how to calculate the answer if the student can’t solve it. I would love this app if the solutions provided were a range of mental and written strategies rather than just the vertical algorithm. Again for those comfortable with this as the one method for solving equations, it is a winner. For those wanting more than that, it falls short. YourTeacher.com and Khan Academy apps – two apps for the latest trend in Maths Ed – Flipped Teaching. Again I applaud these apps for the step by step support for children to follow to achieve success. The down side for me is the one solution fits all approach without involving the children in the discussion. At the end of the day, they tell the student what to do, but tend not to ask why. Algebra Touch – a nice app that allows you to manipulate numbers by clicking and dragging, splitting them into simplified forms to aid in solving algebraic equations. Requires discussion to develop understanding of what is actually happening but the interactivity has potential. They are all Fun games or sound step by step procedural apps for practising newly developed skills, monitoring progress or challenging students to improve. However, the games don’t teach or develop new understanding and the procedure apps don’t give scope to different strategies that may be better options. Some may argue that these apps enhance the users’ number knowledge through practice and repetition. This may be the case for some like myself who responded well to this method when I was in school. However, just as many of my friends and colleagues past and present have not developed the same understanding and find themselves relying on written methods they can’t necessarily apply mentally or to complex problems they have not exposed themselves to since college. Drill and practice 20 years ago has not developed their permanent understanding. This is why I support a more multiple strategy/understanding based model. The procedural apps can be effective if followed up with discussion to ensure the students have developed understanding, not just followed steps. These apps could easily be improved if they included a range of strategies. One app that does that is School A to Z, although I’m not sure it is available outside of Australia, as it is developed by the NSW Education Department. It includes instructions for a range of computational strategies based on Australian methods and curriculum standards. I would love to see more apps being developed by actual education experts rather than just app developers who like Maths their way. 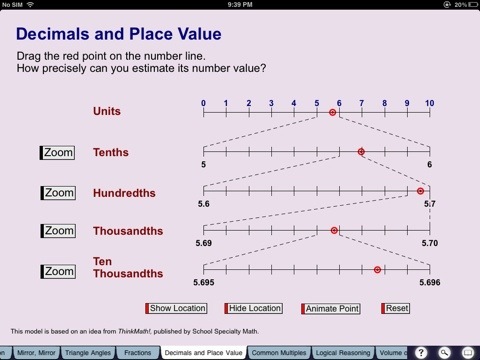 Another app I love because it presents a strong mathematical strategy focus in Mathemagics. Its main purpose is to present a wide range of mental calculation strategies. It provides the methods and tricks and then allows you to practise them within in the app. There are a range of apps that allow for more open ended problem solving. 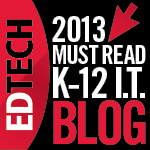 These apps allow for critical thinking to take place, for choices to be made. They offer problems with multiple solutions and allow opportunities for students to choose the operations they need to solve the problems. As a result, conversations can take place between users to discuss how best to solve the equation. Aydox– a challenging mental arithmetic game that involves strategy, thinking ahead, multiple calculations to think of possibilities. 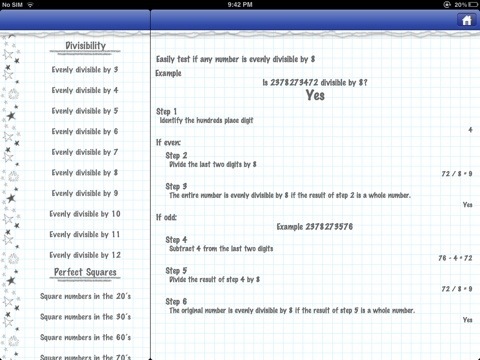 This is the type of Maths App that can encourage a lot of mathematical thinking. At its simplest level, it can be used to create equations that equal or nearly equal given numbers on the matrix. At the highest level complex thinking takes place to try to score the lowest possible score. 3D Math – basic equation creation involving problem solving and critical thinking. It allows you to alter your initial choices and think about the possibilities in front of you to solve the problems. It is time based which still makes it difficult for weaker students to engage in. 24 Challenge Lite -based on the 24 game, using numbered playing cards to find equations that equal 24 using four numbers and any of the 4 operations. This is where the iPad’s touch interface should excel. Apps where users can drag and drop objects to sort, count, group, divide, increase, decrease etc, should be n abundance. Again though, I haven’t found a massive range of apps to mimic the interactive features of electronic whiteboards or websites like NLMV. There seems to be toomuch of a focus on number facts on the iPad. Nevertheless, here is a sample of apps that fit the description. Virtual Manipulatives – an app that lets the user drag and drop fractional parts representing decimals, fractions or percentages. Motion Math HD – physically manipulate by tilting iPad a fraction in a ball to land on a blank number line in its estimated position. Fractions are presented as decimals, percentages, fractions and visual models. Quite engaging and challenging, developing visual estimation of fractional size. SketchPad Explorer – offers a range of manipulatives in Number and Geometry. Potentially a very good app if more variety added. Think 3D – in the app, the user gets to explore and build 3D objects, rotating the shape for different views. These are the kinds of apps I want to see more of on the iPad. It sells itself as a magical touch device. It should be full of possibilities for building, altering, creating. Its features shouldn’t be wasted on just pushing numbers to answer simple number facts. As there are over 1/2 million apps in the App Store, I’m sure there are hidden gems I haven’t discovered. 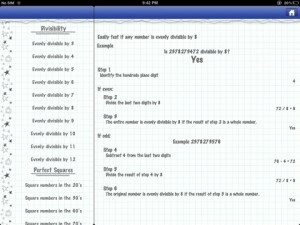 I would love to hear from others out there on the Net about Maths apps they have found useful. If you want to agree or disagree with me about the current crop of apps I’ve discussed here, I’d appreciate any comments. In my next post I’ll discuss Maths reference apps, the role of screen casting apps in Maths and how to use apps not specifically labelled as Maths apps to enhance the Maths program. I’ll also look beyond Number and talk about apps for other areas of Maths.